Franschhoek may hold the title of South Africa’s culinary capital, but as one of the largest Winelands towns in the country, Stellenbosch claims more than its fair share of top dining spots, quaint cafés and vibrant bistros. And truth be told, the eateries in the area are as well worth a visit as any of the region’s well-known wine farms. Not to mention, they’re veritable oases for anyone touring the oak-lined streets of this charming residential centre. 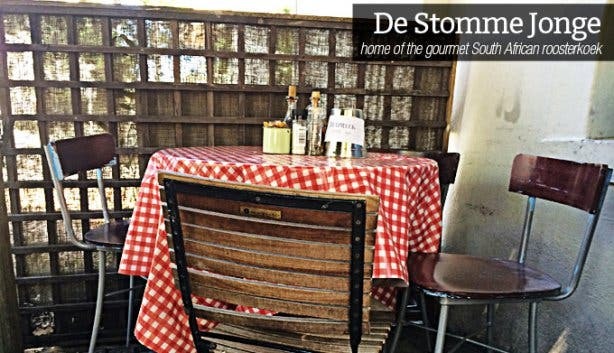 So below, you’ll find our comprehensive guide to noteworthy restaurants in Stellenbosch. We’ve kept the focus on the town itself (there are plenty wine estate eateries not mentioned here) and we’ve attempted to keep the overview as varied as possible to cater to all tastes and budgets, no matter whether you’re on the hunt for a cute daytime coffee shop, a vibey pizza place or an award-winning fine dining destination. The couple behind this charming, relatively young restaurant is adamant that guests should feel like they’re visiting a friend’s house rather than a café. Accordingly, the ambience is warm and inviting, the décor is eclectic and homely and even the name is a nod to family life – it’s the title of a bedtime story that owner Michael wrote for his son. As for the fare, the light and airy eatery specialises in good, honest food made with love, and the menu features options like homemade porridge oats, gourmet sandwiches, cheese and meat platters and unusual salads. The founders roast their own coffee daily in one corner of the shop, but also serve teas, wines, craft beers and more for non-java fans. Tip: Do not leave without trying one of the restaurant’s jaw-droppingly good pastries– the owners home-bake creative masterpieces like Beetroot and Apple Cake with Chocolate Ganache or Sweet Potato Cheesecake. Three dishes worth trying:Mushroom Scrambled Egg with a Spinach Croissant; the Roast Lamb, Pear Chutney, Goat’s Cheese and Rosemary Sandwich; and the Chorizo, Baby Marrow, Chilli and Goat’s Cheese Salad (do note: the menu changes regularly). 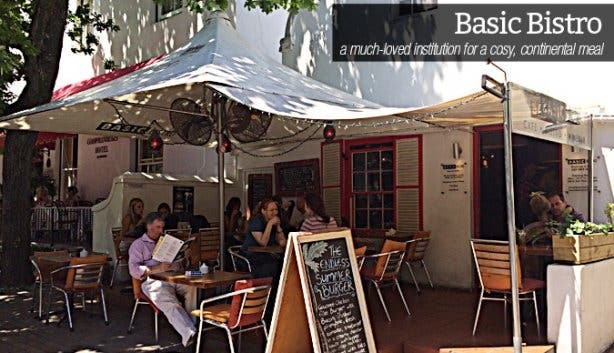 Dubbed the cosiest restaurant in Stellenbosch by some, Basic Bistro is something of an institution in the town and prides itself on its warm, intimate atmosphere. 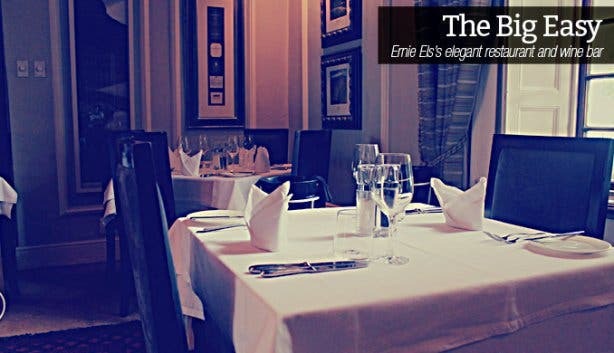 The eatery is open for breakfast, lunch and dinner and is as ideal for a bite with friends out on the shaded patio as it is for a romantic meal with a special someone tucked away in one corner of the small indoor space. Ambient music and excellent coffee are the order of the day, and the menu is dominated by hearty continental dishes, including gourmet burgers, saucy pastas, steak and Cape Malay curry. Tip: Visit at night rather than during the day – fairy lights on the terrace and a soft, orange glow inside give the space a special charm in the evening. Three dishes worth trying: The Dukkah Chicken Pasta with Blue Cheese and Cream Sauce; the Matured Rump Steak with Creamy Pepper Sauce and Baby Potatoes; and the Home-baked Lemon Blueberry Cheesecake. Perched on the corner of Bird and Church streets, Schoon de Companje is hands-down one of the most magical destinations in Stellenbosch. The warm, heavily wooded venue started out as the incredibly popular De Oude Bank Bakkerij, but today it is a space where multiple artisans collaborate under one roof. 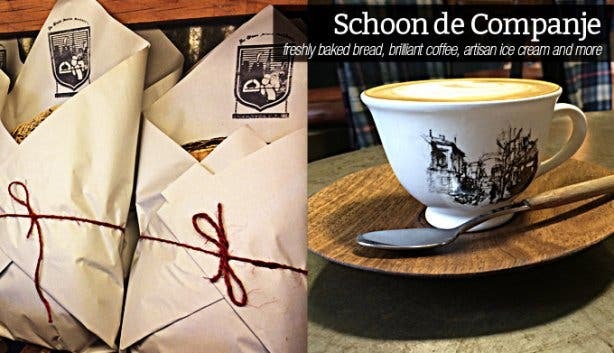 Laid out like an old-school marketplace from the time of the Dutch settlers, the double-storey setting is home to a coffee bar and roastery, a fresh produce stand, a small ice cream parlour, a boutique wine shop, an ethical butchery and, of course, owner Fritz Schoon’s renowned bakery. Delicious breakfast, brunch and lunch dishes can be enjoyed in several different eclectic corners of the restaurant, and almost every meal comes served with slices of Fritz’s organic, home-baked bread. We challenge you not to fall in love with the fare and the romantic nostalgia of this special space. Tip: The restaurant hosts a pizza, craft beer and live music event every Saturday night from 7pm onwards – tickets are sold at the eatery or via Quicket.co.za. Three dishes worth trying: The Creamy Scrambled Eggs on Toasted Sourdough; a create-your-own bread and produce platter; and the Smoked Chicken Pizza with Feta, Avocado and Balsamic Glaze. Opening hours: Tuesday – Friday: 7am – 6pm; Saturday: 8am – 6pm (live music from 7pm); Sunday: 8am – 1:30pm (note: the restaurant will also open on weekday evenings from November 2014). This elegant, all-white daytime eatery boasts a clean, contemporary aesthetic that not only makes it the hangout for the trendy crowd but also helps to keep the focus firmly on the food.Everything on the menu is fresh, homemade and imbued with something special, and the wide selection of pastries and confections are to-die-for too (think passion fruit tart, gluten-free chocolate cake and burnt butter doughnuts, for instance). Aside from the a la carte offering, the stylish restaurant puts together pay-by-weight harvest tables for both breakfast and lunch – the first comes laden with creamy yoghurt, poached fruits and a variety of granola types and the latter is filled with an ever-changing spread that features items like pork belly, brisket, fishcakes, corn bread, potato salad, Italian meatballs and more. Tip: EveryFriday, Meraki runs a fried chicken and craft beer harvest table special between 12pm and 3pm. Three dishes worth trying: The Beef Brenaissance Burger; the Pulled Pork Sandwich with Pineapple and Red Cabbage Salsa; and the French Toast with Maple Syrup and Brûleéd Banana. 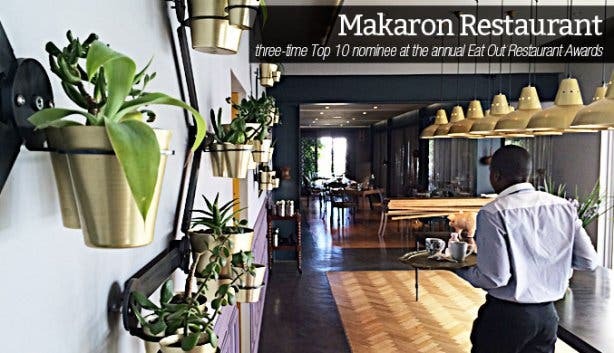 The acclaimed Makaron Restaurant at five-star boutique hotel Majeka House is a spectacular fine dining restaurant with heaps of character – a fact that’s earned the eatery three consecutive nominations for the annual Eat Out Restaurant Awards. The venue’s décor is elegant but at the same time bold and quirky, and its food is whimsical, imaginative and an alluring reflection of chef Tanja Kruger’s offbeat personality and time spent abroad. Guests can opt for a six- or four-course offering or simply order off the a la carte menu, which features wine and beer pairing suggestions for each dish. Tip:For an unforgettable dining experience, pre-book the chef’s table and enjoy a five-course dinner in the restaurant’s kitchen. Three dishes worth trying:The Akamiso Seared Tuna with Dragon Cracker Crumble and Smoked Tofu; the Pork Belly with Jewel Sweet Potato, Apple and Mebos; and the Fifty Shades of Chocolate dessert. Price grading:Pricey – this is a post-payday indulgence. A favourite amongst locals and visitors, the quirky and eclectic 5 Ryneveld is housed in an old Victorian building on, you guessed it, Ryneveld Street, and in honour of the number in its name, the eatery stretches across no less than five themed rooms: a study, a library, a formal dining room, a bedroom and a lounge. 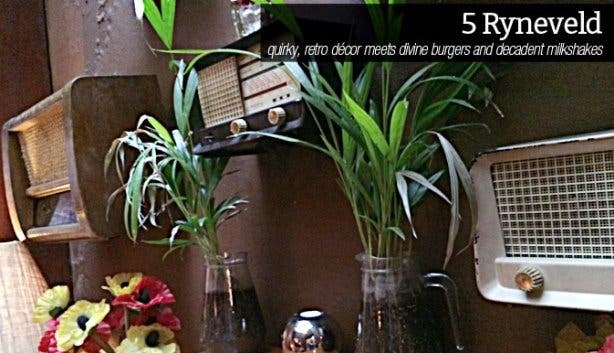 The space is dotted with retro 50s-style furnishings (think vintage radios and antique teapots) and adorned with the bold patterns and sunset colours of the 70s, but the food is up to scratch with contemporary times. Although the restaurant serves up a little bit of everything, from wraps and salads to savoury pancakes and decadent milkshakes, it is especially well known for its quality meat dishes. Tip: Every Monday and Thursday evening at 8pm, 5 Ryneveld screens films and documentaries in its small upstairs movie room – tickets can be booked through the event organiser Cinemuse. Three dishes worth trying: The 5 Star Gourmet Burger with Fresh Rocket, Camembert, Sweet Chilli Sauce and Ginger Caramel; the Moroccan Lamb Pita (veggie pitas are available too); and any of the steaks. 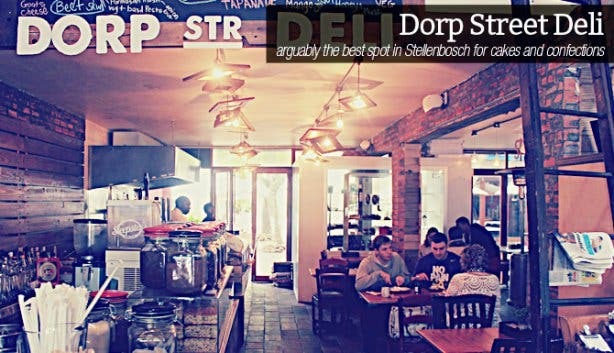 This Dorp Street café is the perfect pop-in if you’re looking to enjoy a wholesome bite in a relaxed, homey environment. The New York-style deli, which boasts rustic wooden features and red brick walls, is child friendly (there are even sweet dispensers in one corner), but its trendy aesthetic and upbeat vibe makes it popular with the young working crowd too. While the eatery is most loved for its generously sized burgers, it also serves gourmet sandwiches, hearty breakfasts, mezze platters and more, and on the drinks side, there’s great coffee and craft beer on tap. What’s more, as one side of the deli is devoted to the Mila Cake shop, visitors can also pick up some heavenly cakes, tarts and petit fours – they’re masterpieces in both look and taste. Tip: The deli has a small outdoor courtyard section, so guests are welcome to bring along pets too. Three dishes worth trying: The Moroccan Curry Burger; the Crispy Pork Belly Sandwich with Honey and Mustard Sauce and Poached Plums; and any of the confections. A relatively new addition to Stellenbosch, this craft beer pub and pizza place is appropriately named considering its deck peers out over the scarecrow-dotted field of the Mooiberge Strawberry Farm (its patrons say it claims the best view in the area). While the outside surrounds are stunning, the restaurant’s interior is handsome too – it’s chic and stylish, but also warm and inviting. Of course, one of the highlights of the eatery is its huge selection of craft brew on tap (there are both familiar and unusual options), and many of its menu items are, in fact, infused with ale. Speaking of the food, the Crow, as it’s fondly known, is most popular for its gourmet beer pizzas, but it serves up tapas, platters and a few hearty pub grub items too. Tip: Don’t leave without sampling the restaurant’s homemade strawberry beer, which has been bottled under the name The Red Crow. Three dishes worth trying: The Fat Tony Pizza (salami, sundried tomatoes, mushrooms, feta and basil), the Homemade Beef and Ale Pie; and the cured meat or cheese platter. This Ernie Els-owned restaurant and wine bar is a very special dining destination. It’s found in a grand, historic building complete with wooden floors and ornate fireplaces, and every room in the house – there are several – has its own look and charm. Aside from upmarket dinnertime spaces, there’s an indoor courtyard, a handsome library and cigar lounge, a stately bar area, a gorgeous daytime room with a glass ceiling that lets the sun pour in and a tranquil outdoor garden section. The elegant eatery specialises in fine, proudly local cuisine and also boasts one of the largest wine selections in Stellenbosch (it stocks over 150 different varieties). Tip: It’s recommended that you make a booking at this restaurant, especially if you plan to dine here on a Sunday or Monday evening during summer. Three dishes worth trying: The Cajun Fishcakes with Crème Fraîche, Peppadew Pesto and Wild Rocket; the Venison Loin with Caramelised Sweet Potato Purée, Julienne Vegetables and Masala-infused Jus; and the three-part Or Els Dessert Platter. Price grading: Surprisingly reasonable for a restaurant of this stature, but still a bit above average. Buried just behind a grand oak tree on Ryneveld Street, this tiny restaurant is the only spot in Stellenbosch that serves original South African roosterkoek (braaied bread). And not just any roosterkoek – a special gourmet version. Customers can order their dough topped with anything from biltong and cheese to syrup and salted butter and enjoy the filling meal at either an indoor or outdoor table bedecked with a red-and-white chequered cloth. At night, the eatery, which has a lazy small-town feel about it, takes on more of a pub role and keeps guests happy with Stellenbrau craft beer on tap and other brews to complement the carb-heavy dishes. Tip: If you wake up late, this is the place to go for breakfast – the restaurant serves its egg and bacon roosterkoeke until 1pm. Three dishes worth trying: The Oom Boom (three-layer club sandwich-style roosterkoek with basil pesto, avocado, sundried tomatoes and a choice of two meats and two cheeses); the Madiba (bacon, brie, preserved figs and salted butter); and the Stomme Jonge platter (two roosterkoeke with a selection of cheeses, meats, olives, preserves, jams and pestos). Price grading:Reasonable – breakfasts are incredibly affordable. 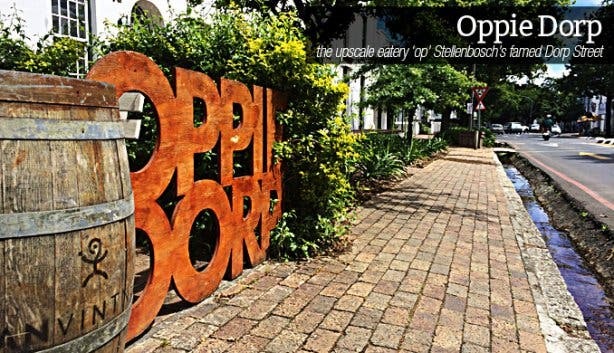 Found on Dorp Street (as its Afrikaans name states), Oppie Dorp is a lunch and dinner venue that elevates the dining experience a little above the ordinary. While the vine-covered patio in the front of the restaurant is very relaxed, inside is slightly more chic and upscale and there’s a definite focus on personalised service. The menu changes daily as the kitchen is intent on using only fresh, seasonal ingredients, and much time is invested in the preparation of each, well-presented dish. Overall, it’s a restaurant that’s ideal for anything from a smart corporate lunch to a romantic evening meal or family dinner. Tip: Try visit on a sunny day, so you can sit outside on the pretty, summery terrace. Three dishes worth trying:As the menu changes every day, it’s difficult to suggest a fixed three, but if available, try the Deboned Duck Breast, the Patagonian Calamari and the Springbok Carpaccio as a starter. Price grading:A little on the pricier side. Named after a lush gardenia with sweet-smelling white flowers, this Stellenbosch breakfast and lunch spot is tucked away within the town’s verdant Botanical Garden, close to the university. Though the café does claim an inside section for rainy days, its alfresco area is the highlight – a cluster of café tables rest in dappled sunlight below leafy boughs and amid lawns and water features. The eatery’s food is simple but tasty, with options like gourmet croissants, omelettes, chicken mayonnaise sandwiches, fresh salads and cakes on the menu. Not to mention, there are few proudly South African items too, like bobotie and bredie. Essentially, Katjiepiering is a good option if you’re looking for a down-to-earth dining experience in the middle of nature. Tip: The restaurant runs an early-bird breakfast special that treats visitors to a muffin or croissant with coffee or tea for R20 on weekdays before 10am. Three dishes worth trying:The fresh scones, the Pepper Sauce Burger and the Katjiepiering Salad. What sets La Romantica apart from other restaurants in Stellenbosch is the sheer variety of food options on offer. The large double-storey diner, which rests just outside of the main town centre, serves everything from pizzas, pastas, burgers and steaks to seafood platters, pork schnitzels and sushi. So, you’re guaranteed to find something that suits your tastes. As a cosy, comfortable restaurant, the spot is ideal for a family breakfast, brunch, lunch or dinner, and kids are catered for with a rather extensive children’s menu. Tip: La Romantica runs weekly pizza, sushi and schnitzel specials, so be sure to ask about these. Three dishes worth trying: The La Romantica Pizza (bacon, feta and avocado), the A la Patricia Pasta (chicken, mushrooms and onions in a creamy basil pesto sauce) and the Johnny Blue Steak (rump or sirloin topped with melted mozzarella, bacon, mushrooms and a creamy blue cheese sauce). Found a place to eat but still looking for enjoyable activities in this vibrant town? Take a peek at our guide to things to do in Stellenbosch. In the mood for some delicious pizza and cocktails, why not check out Tiger's Milk in Stellenbosch? For yummy burgers and extraordinary milkshakes, check Hudson's The Burger Joint in Stellenbosch.